As an athlete, I am very accustomed to moving a lot. 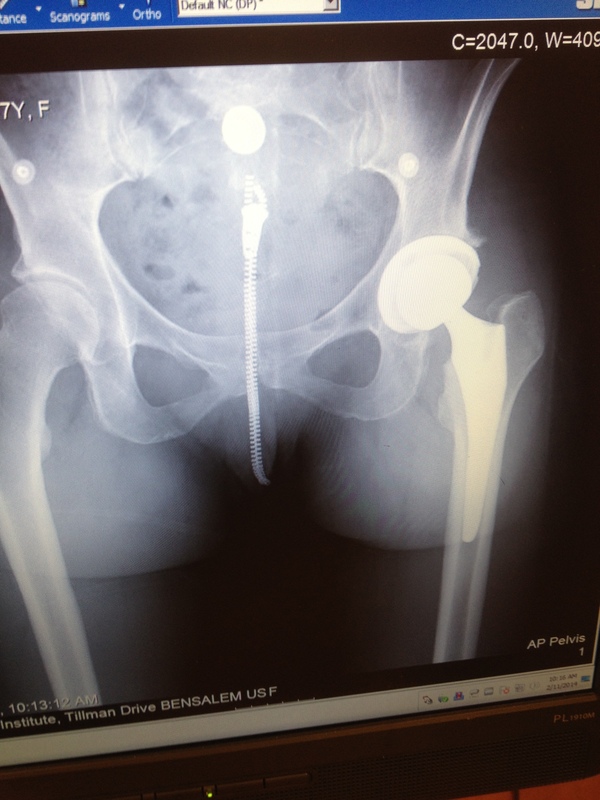 After hip replacement surgery, well, that moving, although seemingly nothing, was too much for my body to handle. In the 2 weeks post surgery, I have had to embrace the healing process and find joy and solace in allowing it to happen on my body’s time, not the timeline in my head. I think this is actually harder than the anti-inflammatory diet! This is my post op X-ray of the hip replacement surgery. Healing well! I have learned to listen to what the body is trying to tell me. I am trying to be patient and not push too hard (not normal mindset of an athlete….) and embrace this healing process. It IS a process. Each day I have gotten new aches, pains or muscle spasms. Some days I get woken up in the middle of the night, my body telling me I over did it in some way. ‘But I didn’t do anything!’ I would think…..oh, wait. you get up, brush teeth, do normal bathroom routine, go down stairs, make coffee, try to vacuum floor with dust buster, sit for 5 minutes checking email, more coffee, more emails….then juice. Before I realized it days later, I was on my feet and moving for over an hour each morning!! No wonder I had aches later in day by 1-2 pm. I learned to break up my mornings into smaller chunks of time, with longer breaks in between my activities. If I got tired, I would take a nap. My body needed sleep in order to heal! It needed rest when it needed it, not when I could schedule it. Each day was different, but each day I scheduled only a few clients to keep the stress to a minimum. But it felt great to be working with clients again, helping them with their health, pain management and weight goals. No one can tell you how fast you will or will. to recover. No one has written down the ‘what to expect’ guide for after surgery. You have to learn it on you own. I had to also learn how to embrace the healing process as it was unfolding for me and not rush it. The more I do trying to train my way to recovery, the more I was actually delaying the process. I am a competitive athlete, and now I am making this recovery competitive – let the body heal. The fitness will come back later. ‘Baby steps’ takes on a whole new meaning after surgery! It is like learning how to walk again, how to move again. Even 5 minutes can be a strain of a new activity. Hard for any athlete to slow down this much, surgery or no surgery. But I am learning where that fine line of balancing a bit of a new activity and motion is vs over doing it. Yes, it took me almost a full week to 10 days to find that line, and each day I find myself a little stronger. Each day I find a movement that no longer hurts. I find myself pulling back on the reigns to keep me from doing something too soon, like biking on the trainer for 30 minutes. Maybe I should try 6-8 minutes or wait another day…..And when I did add it back, I started with 2 minutes, then 6, then 12, and worked up to 30 minutes. Each ride I added 15 seconds more of harder efforts while maintaining 1 minute easy. Each day, I felt good doing it. But I had waited 10-14 days to even try riding. Now, almost 4 weeks later, I can ride the bike trainer for 45 minutes with longer intervals of harder efforts, but still 1 minute rest. I added single leg drills the past 2 days which is enough of a new motion, that I did not add more time to my session. Funny thing is, I am still riding in whatever I am wearing rather than cycling clothes – that should give you an idea of how hard I am pushing. Not that hard, as I am still sometimes in my pj’s! But it feels good to be active again. I also added Physical Therapy last week which also is taking up some extra energy, training the muscles to engage and help stabilize my left hip. During my last trainer ride, that was the added focus. Reason enough NOT to add more time to the ride time. I needed a later in the day, as that new way of moving is still tiring 4 weeks later. Embracing the healing process is still a daily activity for me. If I need to turn off the alarm so I can get a full night of sleep, I do. I am continuing with the anti-inflammatory plan as I want my body to heal as well as it can, without wasting energy on the foods I eat. Last night, I woke up feeling a bit groggy and lethargic – oh, that was from that muenster cheese I ate yesterday! I won’t be doing that regularly. This is an example of eating an inflammatory food and how it affects you the next day. During the healing process, these inflammatory foods need to be avoided as much as possible to allow the body to use its energy to heal and repair. Once in awhile, dairy can be okay. But on a daily basis, maybe that cheese should not be included into the diet. Embracing the healing process can be challenging for anyone, but more so for an athlete. We want to move, we want to run, we want to ride…..now. But we have to embrace the healing process as it is. You cannot speed up Mother Nature’s healing process. If you try, you will be in pain and actually delay healing. Surgery is traumatic to the body. We need to allow that trauma to subside before we start to push again. For more information about the Anti-Inflammatory Diet Plan or package, please contact Joanna at www.n-im.net and schedule a time for your pain-free plan. What do you have to lose but the pain? This article sure hits home. I am recovering from rotator cuff repair surgery. 4 Weeks into it, I have two more weeks in a sling before I can really do anything. The physical stress can be managed with medication. The mental/emotional stress of not training is really tough to overcome. I want to heal NOW. I want to run, ride, swim, lift, etc. I’m tired of ‘resting’. Let’s get moving. I keep hearing … you have to give your body a chance to heal. Don’t sabotage your recovery because you are too stubborn to give your body a rest. Rest now. It will pay off in the future. I was happy to hear I’m not the only athlete struggling in recovery. this is exactly why i wrote it – i know others would go thru it and it is hard on so many levels. I am officially 4 weeks into it now and started PT. i had to take a nap this afternoon! i am back on the bike trainer, but still only at 45 minutes which still seems like nothing in my head, but i know my body won’t take more than that yet. I have increased the harder intervals with still 1 minute rest, and only just started single leg drills this past few days. it is so hard to know what that ‘rest’ is. Are you able to walk or anything? i know moving around was enough to keep me sane, even if it were pacing in my house down halls – too icy to walk outside! good luck! and let me know if you need more support! !